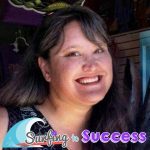 We’re excited to welcome Mercedes from Surfing to Success to the blog today! 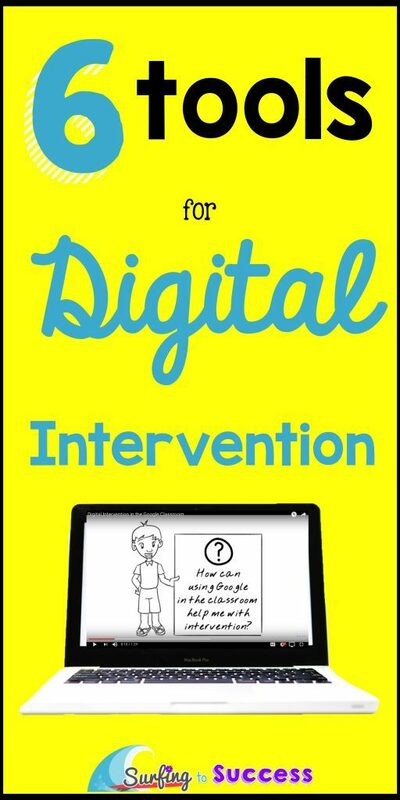 Please read her post about six tools you can use for digital intervention in your classroom. Enjoy! Digital learning tools can make targeted instruction quick and easy. The challenge is to wade through all the options out there and focus on the tools that are right for your needs. Let’s look at six tools that can help you with targeted intervention. As teachers we want to meet students’ individual needs. Traditionally, intervention looked like pulling a group of students to a kidney table and reteaching while the rest of the class worked on an assignment. The limitations of this is feeling like you can only help a few students at a time while neglecting the rest of your class. As technology develops, ed tech tools are making it easier than ever to meet the needs of many students at the same time. Recently, I wrote a blog post about 6 Benefits of the Digital Classroom. This brief video sums up the benefits. You can read more details here. There are a ton of tech tools out there to help us in the classroom. Don’t feel like you need to try them all. Start with one or two and get comfortable with them. Then, let your students get comfortable with them before you introduce something new. Sometimes, it can be easy to feel like we have to do everything. Remember quality over quantity. Weebly allows you to create a free website with simple drag and drop features. 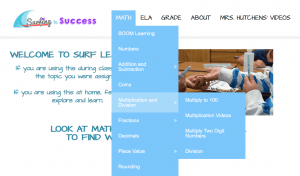 Of the many sites I’ve linked on my class website, Multiplication.com is my favorite. If you teach 3rd-5th grade, you really should check it out. Having clear goals is essential for success. With this site your students can practice specific facts that they need to learn in an engaging environment. 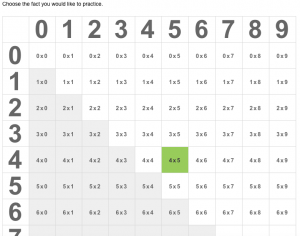 Students can use the Multiplication Game Navigator to choose a fact to practice. It will give them a few options for games, and the game will make sure that that fact comes up more than any other. Boom Learning is a new site that works on any device. Many of your favorite authors from Teachers Pay Teachers are now offering resources that can be used entirely online. My students tested it out last year and absolutely loved it. I had students wanting to do math problems over and over, which is every teacher’s dream. If you haven’t checked out Boom Learning, you can check it out for free and see if it is for you. There are activities for all different subject areas spanning K-12. Take a look. Khan Academy is a fantastic free site. Whether you want to learn 4th grade math or Organic Chemistry, they have it. 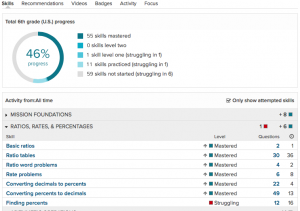 When our school started using Khan Academy, I honestly didn’t think our kids would like it. It isn’t colorful or flashy, so I didn’t think they’d find it fun. Fortunately, Khan Academy takes the idea of a growth mindset literally and has built in ways to encourage kids to persevere. The kids love earning badges. (So do I!) We use it in 4th-6th grade math. As an intervention teacher, I love that I can assign specific students specific lessons and track their progress. Teachers can look at specific students and find a ton of useful data. If you teach middle or high school students, be sure to check out Pixar in a Box. Khan Academy teamed up with Pixar and their animators. The lessons focus on how the animators at Pixar use math. They are super interesting. If you teach Kinder or primary grades, you will love the latest addition. Duck Duck Moose, an app company, just became part of Khan Academy, and all their apps are now free. Get their iPhone and iPad apps here. Get the Android apps here. Last year, I started using Google Slides as a form of instruction and I fell in love. While many think of Google Slides as a presentation tool, I love it for delivering content students can work through at their own pace. Check out my blog post about using Google for writing instruction. With the interactive nature, it is easy for students to work on their own or send you a chat asking for help. Some of my students who never asked for help started asking while using Google Slides, because they could send a message privately, and no one would know I was helping them. Immediate feedback is simple and easy when practicing math with Google Slides. My Simplify Fractions resource gives students the chance to interact as they learn. Setting goals and reflecting on data is a great way to help students learn to direct their own learning. Google Slides allows students to have a digital journal where they continually set goals, track data and reflect. 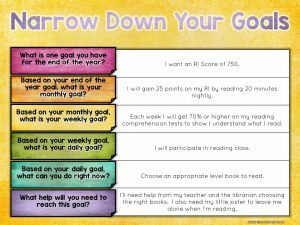 Find out more about how to use Google Slides for goal setting, data tracking, and reflection in this blog post. This summer, Google added an amazingly helpful feature to Google Forms. Now, you can turn any form into a Google Quiz. Why grade papers when Google will do it for you?! This versatile tool can be anything you want it to be. You can use it as an Exit Ticket, a quiz, or a test. You can even add pictures and videos. One of the best intervention features is the feedback option. You can choose to let students see their results and have it automatically include a link to a website for practice when they get certain questions wrong. If you would like detailed help, check out my Google Quizzes blog post for step-by-step examples. Which digital intervention tool will you check out today? Mercedes Hutchens is a K-6 Intervention teacher with a passion for helping students meet challenging yet obtainable goals. 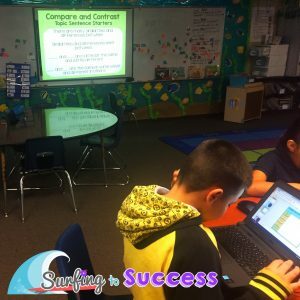 In her 19 years of elementary education, she has fallen in love with taking complex concepts and breaking them into fun, manageable chunks for her students and then sharing them on her blog, Surfing to Success, and on TPT. She enjoys taking photos while on adventures with her husband and puppy. She recently started sharing those photos at Dollar Stock Photos. You can also find her on Instagram, Pinterest, her Surfing to Success Facebook Page , her Dollar Stock Photos Facebook Page, or you can look for her at the beach. Plickers – A Fabulous App for the Classroom Increasing Student Engagement with Interactive PowerPoints 5 Must-Listen Podcasts for Teachers Daily 5™ for Upper Elementary Students Putting the BOOM into Differentiation!